Arsenal boss Arsene Wenger celebrated his 68th birthday in style as the Gunners demolish the Toffees, Koeman's team in the relegation zone. Ronald Koeman doesn't know if he'll remain Everton manager after a 5-2 loss to Arsenal saw his team slip into the Premier League's relegation zone on Sunday. The statistics are bleak for Koeman: Everton has no wins in its last five matches, two victories in the last 13, eight points from nine games and only six league goals. Everton, which finished seventh in the Premier League last season, is at the bottom of its Europa League group with one point from three games. "I don't know," Koeman said when asked by broadcaster Sky Sports about whether he could be fired. "I told the players I believe in them, the commitment of the players. But if you are negative thinking, and everybody is doing that in this moment, all these kinds of decisions are not in my hands. "That is normal because that is football. We have played nine Premier League games, against the first five of the Premier League last season, but this is not the position that is good for Everton." Even Wayne Rooney's re-creation of his famous breakthrough goal as a precocious 16-year-old against the same opposition and in the same Goodison Park net to give Everton an unexpected early lead could not mask the issues the Toffees face. 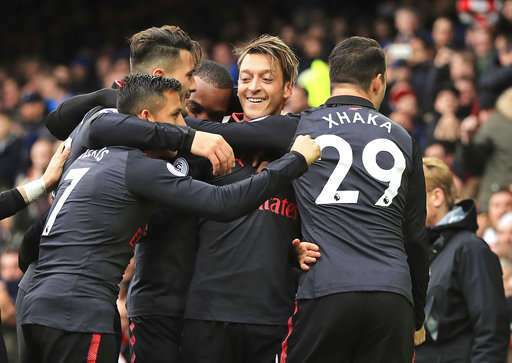 It was an advantage the hosts never looked like holding as Nacho Monreal equalized just before the break with further goals coming from Mesut Ozil, Alexandre Lacazette — after Everton midfielder Idrissa Gueye was sent off — and Aaron Ramsey. Substitute Oumar Niasse pulled one back thanks to poor defending but Alexis Sanchez had the final say with the last kick of the game as Arsenal's eased to a first away win of the season. Everton is not looking like a team that had around 150 million pounds ($198 million) invested in new players in the offseason. How Koeman must wish he could call on the pace of a player like Sanchez, the creativity of Ozil or the finishing of Lacazette. The trio caused problems from the third minute with the overworked goalkeeper Jordan Pickford tipping Ramsey's shot around the post after Sanchez and Ozil combined to cut Everton wide open through the middle. It was a recurring theme for Pickford, who denied Sanchez (three times), Lacazette (twice) and Granit Xhaka in the first half. Ozil, meanwhile, created more chances (six) than all the other 21 players on the pitch. Pickford's save from Xhaka led to Arsenal's 40th minute equalizer as he could only parry the low, deflected shot into the path of Monreal, who scored the club's 1,500th Premier League goal under Arsene Wenger. Koeman switched to a back four with the removal of Ashley Williams intending to shore up space but it left a gap at the back and Ozil nipped in to head home Sanchez's near-post cross in the 53rd minute. The Chile forward, operating on the left, gave Jonjoe Kenny a tricky time on his first Premier League start but the 20-year-old Everton academy graduate was not afforded much protection from more senior teammates. A difficult situation was made worse when Gueye, after a first-half booking on Sanchez, was shown a second yellow card after going in late on Xhaka. Lacazette made it an impossible task from a cross by Ozil, exploiting space down the right, in the 74th minute, extending Arsenal's lead to 3-1. Koeman introduced Oumar Niasse for Dominic Calvert-Lewin, drawing boos from the crowd. Fans might not have another chance to jeer Koeman.